Originally thought to be Van Miereveld's self-portrait, this painting is now considered to be the portrait of an unidentified sitter, probably executed by a member of his studio. The sitter is wearing an embroidered doublet with padding in the typical fashion of the first half of the 17th century, and a silk sash edged with lace. He has a large ruff of lace and wears a goatee also en vogue at that time, suggesting a time around 1625. Portraits were pursued more than any other type of paintings throughout the 17th century in Holland. A great majority of these were commissioned by well-to-do citizens, whether prosperous merchants and professionals, or members of the city patriciates. A three-quarter profile bust of a bearded man in 1620s Dutch costume. Bequeathed by Mrs G. M. Spear, 1970. This painting is a typical example of the type of portraits produced by the Dutch painter Michiel van Miereveld (1567-1641). His production was very large (more than a thousand paintings) but extremely repetitive and lacking of invention. Almost all of his portraits, which include either men or women, follow the same structure: a half-bust shown in three-quarter profile, lacking of expressive features, set against a neutral receding background. This painting was once thought to be Miereveld's self-portrait and the identification of the sitter remains unknown. It shows a middle-aged man wearing an embroidered doublet with padding in the typical fashion of the first half of the 17th century, and a silk sash edged with lace. He has a large ruff of lace and wears a goatee also en vogue at that time. The costume indicates a date around 1625. 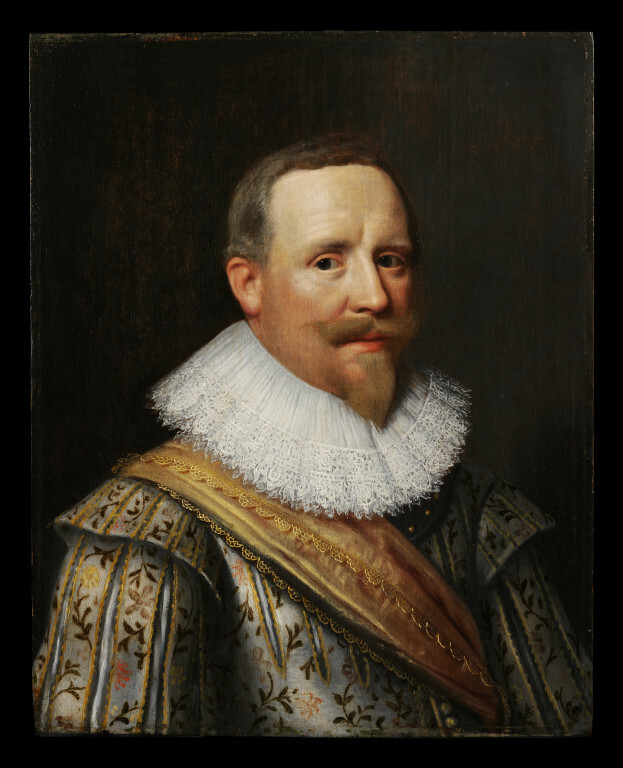 Van Miereveld worked for the Stadholder in The Hague from 1625 and this man may be a courtier or other high official. The neutral receding background is slightly darker on the left hand side in order to provide an interesting play of depth behind the sitter, a typical trend in 17th-century Dutch portraiture. Although the portrait is executed with accuracy, it appears rather stiff and flat. The ruff's edges around the neck are particularly sharp and contrast with the smoothness of the face. 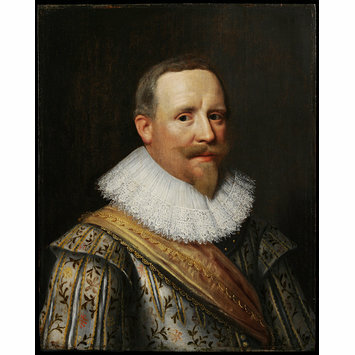 A similar ruff is represented in the Portrait of Ernst Casimir dated 1633 (Risjksmuseum, Amsterdam). These flatness and stiffness are quite common in van Miereveld's large output that includes more than a thousand portraits. However not all of the portraits attributed to him are by his hand but by assistants or close followers. Despite the apparent repetition and lack of innovation, van Miereveld was highly praised as a portrait painter, a popularity witnessed by his appearance in Karel van Mander's, a contemporary art critic, Schilderboeck. Van Miereveld influenced a large group of Dutch portrait painters among whom the most notable were Paulus Moreelse (1571-1638) and Anthonie Palamedesz. (1600/1601-1673/1680). 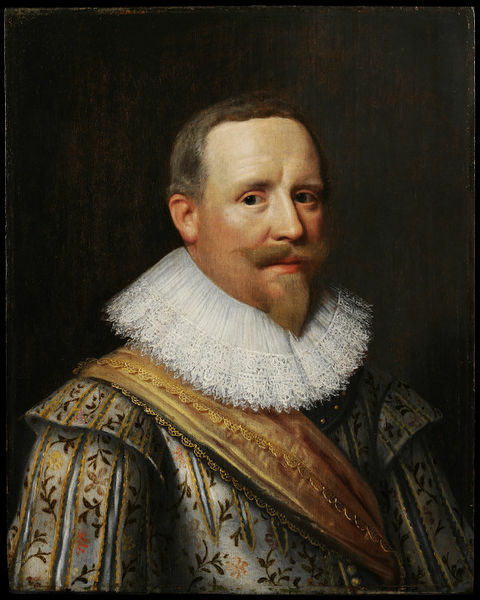 His sons Pieter (1596- 1623) and Jan (1604-1633) were also portraitists. At the end of his life, he had to confront the rising popularity of Gerrit van Honthorst (ca.1590-1656). Kauffmann, C.M., Catalogue of Foreign Paintings, I. Before 1800. London: Victoria and Albert Museum, 1973, p. 190, cat. no. 227.